I see...do you have links to your other homebrew project? love your work. 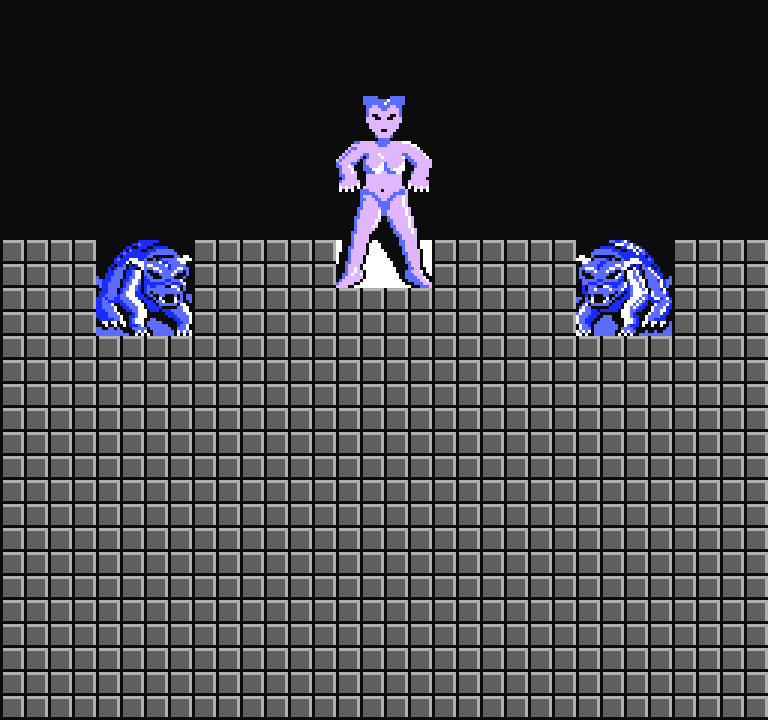 It is a mix of a version of my PC game and studies on NES development, meaning it doesn't have a defined shape yet. I'm implementing basic features that it should probably need, and as my PC game matures I should be able to decide what it should be about. Follow me on twitter! I post updates to my game there. Thanks! I have been working some on this hack, since I'm having trouble focusing on the PC game. I have finished all building fronts now (both doors types and window types may appear on any scene). Nice work! Your graphics never disappoint. I've been looking at this a few times & I have to say that it looks bloody amazing,hopefully you can improve the gameplay & music as well? There are a few tweaks in gameplay, but I gotta say, the game design here cannot be saved. So many things I keep asking myself "why is this even a feature, it should just be removed", but the game is already so simple. I think the biggest gameplay improvements are on the stairs and on the boss fight, I made those a lot more playable. I just found a surprisingly difficult to miss bug: when on the map, if you try to enter a building to the right when there is none (aka when you're on a horizontal street), it will enter the gas station. To the left it will enter a normal building. I think I'll fix this. Strange I never noticed this, maybe it happened and I thought I had pressed a diagonal. As for music, I have no idea. I guess I'll take a look, and if doable I'll try. This is of course something the hack comes with built-in. Amazing, as usual. Nesrocks always amazes me with how awesome his work is. Man this looks so much better than the original! Nice work! You ever thought about doing Ikari Warriors for the NES with some improvements? About other hacks, if I don't have fond memories of a game, it goes down so much on my list that it would take a billion years to get to them. Such is the case of Ikari Warriors. Dr. Chaos I'm surprised I never heard of that game before. Beying released by pony it caught my interest for a bit, but after playing and watching a play through I can honestly say no way. It doesn't look fun to me at all. Goonies 2 does it all so much better, in fact I'm doing a few gameplay adjustments to that game. The differences between the two screenshots are night and day. I wonder what made Activision think that the original look was good enough? It was actually Bits Laboratory who developed the NES version of Ghostbusters. It's almost comical how much lamer the official screenshot looks in comparison. There are a few tweaks in gameplay, but I gotta say, the game design here cannot be saved. So many things I keep asking myself "why is this even a feature, it should just be removed", but the game is already so simple. Well, you could always find some way to repurpose the stair climb or final boss battle. 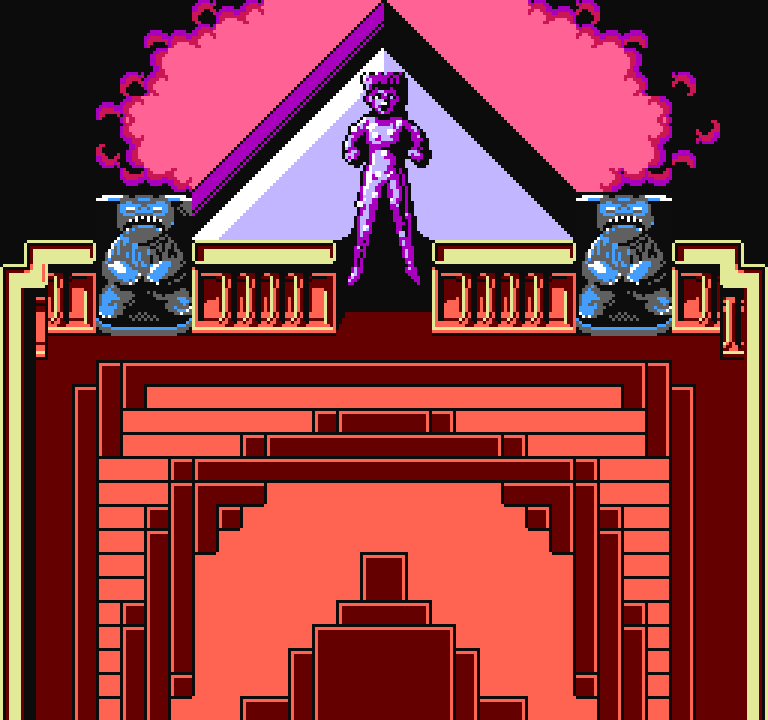 Like, maybe sometimes when you show up at a building, you get pulled into an "alternate dimension" and have to fight some less-difficult variant of the final boss. But of course, that would be an awful lot of difficult assembly work, and it's not like the final boss fight is all that fun in itself. 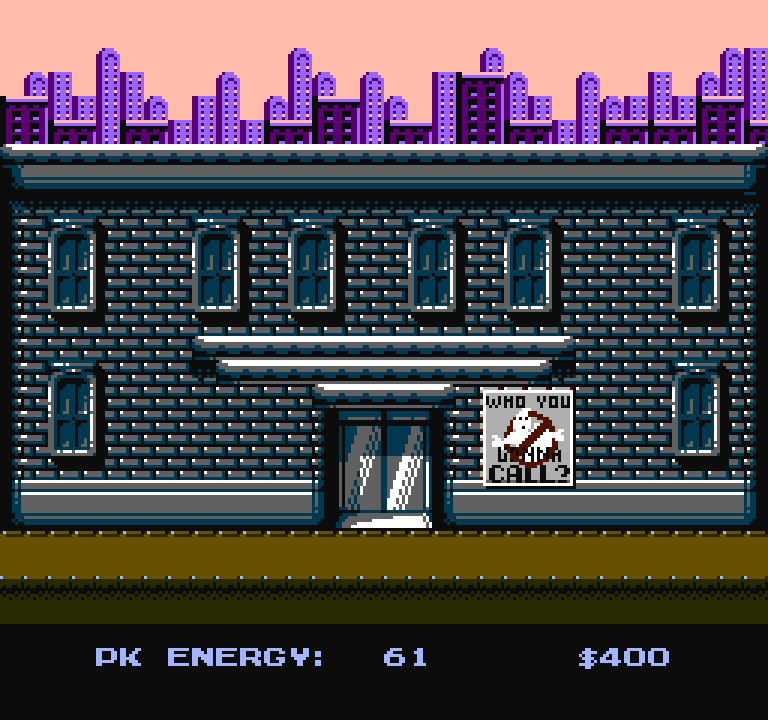 1 - The condition to enter zuul building is bad and isn't even well implemented. You need to have $15000, but once you do, if you go to the shop and buy zuul specific items and go under 15k, you can't enter anymore and you've thrown away your money making items (so now you may be stuck or wishing to just reset the game and start over). To fix this, it would be good to change this condition to time, or to amount of succesful ghost catching levels (it still would need a manual to explain this). 2 - Capturing ghosts isn't fun because it is repetitive, random and slow. This is tough to reprogram into something good. My solution is to cut the cost of some itens a bit to reduce unfun grinding. Other than that there are countless minor problems. 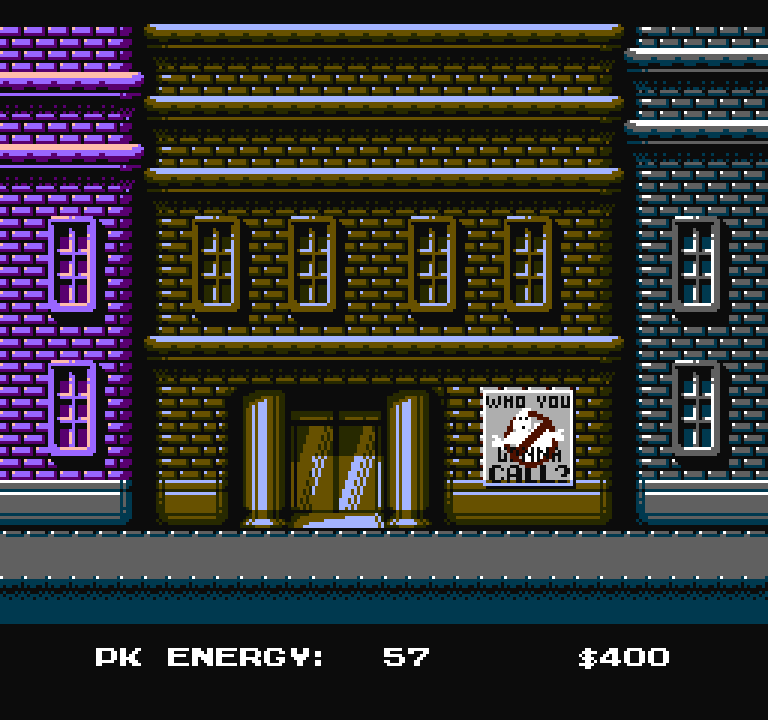 I think with this hack I just want to make it artistically pleasant but have it still be NES ghostbusters in essence. Also, I'm not changing mapper or ROM size, and it's running out of unused bytes. If someone wants to expand the ROM later and make it a good game be my guest. Just give credits for my graphics and original hacking. I think if the voice samples were removed, there would be enough space for everything. I think it could be replaced with a nicer one instead, and either expand the rom or get space from the music which occupies 3100 bytes by itself (that's 3x more than the pitfall 2 theme on the super pitfall hack). The music engine could be improved to be modular and accept looped sections. As it is, there are many repeated parts copied over and over. But that is just too much for me, I'm going to stick to graphics and easy to implement gameplay improvements. This may sound mainstream and dumb, but can this game actually be good? Won't lie, it's amazing how the interesting individuals posting projects here seem to fix games that had every reason to be good but weren't, let alone remixing good ones like some psychedelic rave. I thought that the C64 version, while more simpler then this one, was a good game. Really glad to see some new updates on this, and very impressed with the new screenshots! I do think there's the potential for a good (or at least decent) game in there, and I enjoyed the version I played back in the day, but with more experienced eyes I can see there's some poor design choices. The 'entrance fee' mechanic for getting to Zuul is a good example, which doesn't fit in-story any better than it does in-game. I liked the idea of a 'reputation' meter to work alongside the PKE meter, showing the city's faith in your franchise. (Most actions in the game would then have an impact on either reputation or money, or both.) If you don't meet a certain trust threshold by the endgame, City Hall won't know who they gonna call. I wouldn't know where to start with adding such a thing though, and I do realise that eking out the amount of unused bytes needed for this number of graphical improvements must already be hugely challenging. I'll just look forward to re-visiting the game with it's enhanced graphics once it's complete!